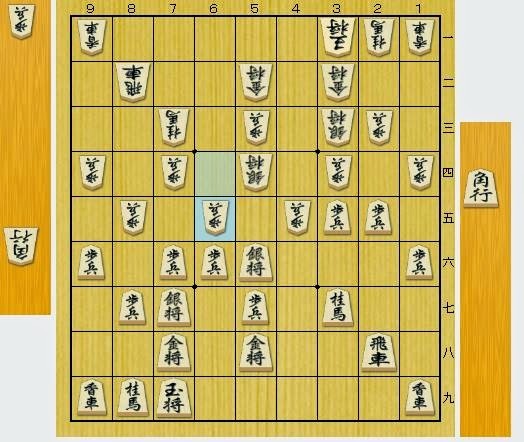 The 3rd game of the Ryuou Title Match started yesterday. Both players formed a same position in Bishop Exchange Strategy. Identical formation at Diag.1 had been in fashion in pro games until about 3 years ago. But, now, the main variation from Diag.1 almost come to the conclusion that sente is winning. Here, sente opens fire with ▲P-45 △Px ▲P-24 △Px ▲P-15 △Px ▲P-75 △Px ▲P-35 (Diag.2). 4, 2, 1, 7, 3 in order. 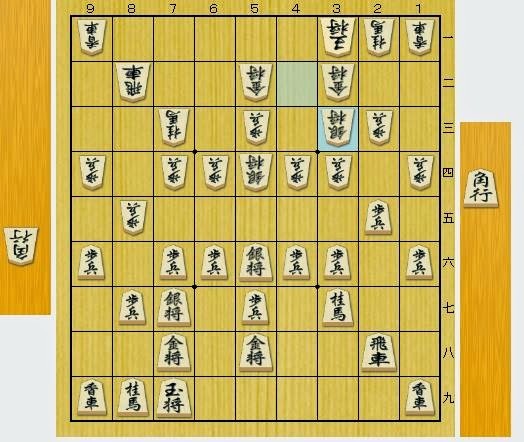 The way to attack with pushing pawns 5 times in a row was discovered by 9-Dan Maruyama, who is one of the top players. Originally, in Diag.1, sente was supposed to attack with ▲P-45 △Px ▲P-35, but, there was the counter attack with △P-65 (Diag.3). The sequence Maruyama discovered is aiming to remove such an attack from gote. 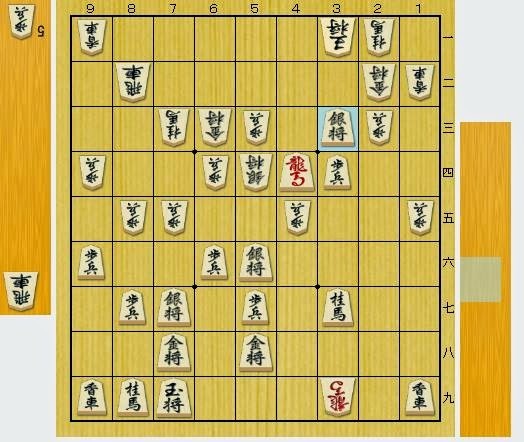 By pushing the pawn on the 7th file in advance, whenever sente gain a pawn, ▲P-74 would occur, then force gote to play defensively. 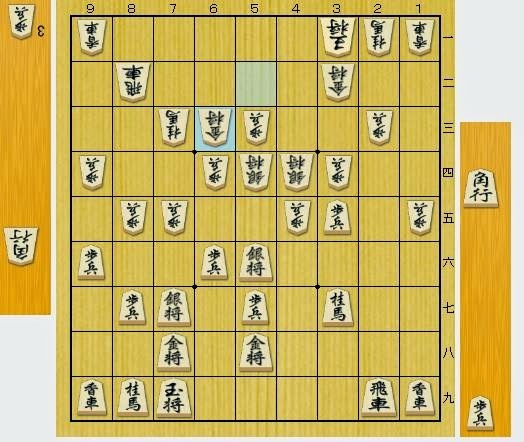 Although at Diag.3, it is not necessarily bad for sente, it is recently considered that pushing pawns 5 times is better than two times. From Diag.2, △S-44 ▲Rx24 △P*23 ▲R-29 △G-63 (for protecting the knight's head) (Diag.4) used to be a main line, but, now, most pro players hardly play like this because of the conclusion that sente is winning. There are plenty of complicated variations around here, which many players had been researching for decades. I can't write down all of them. In brief, with ▲P*12 △Lx　▲Pｘ34 △B*38 ▲R-39 △B-27+ ▲B*11 △+B-28 ▲Bx44+ △+Bx39 ▲P*22 △Gx ▲S*33 (Diag.5), sente can finally win. This line is called Tomioka Style (8-Dan Tomioka invented). Therefore, in Diag.2, other lines are required for gote instead of △S-44. For example, △Px35 ▲Nx45 △Sx　▲Sx △B*37, and △P-86 ▲Px △P-76 ▲Sx △Rx86, and △R-81 have been played. Moriuchi selected the line from △P-86 (Diag.6). 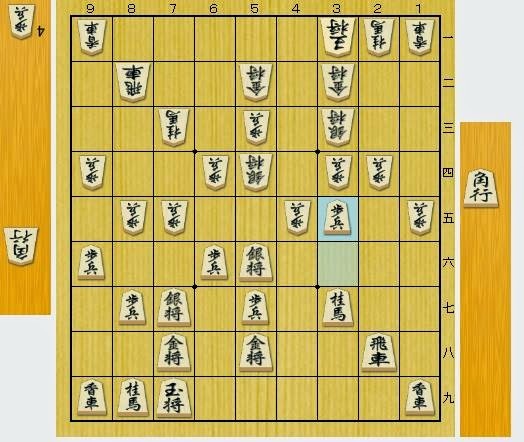 It was different from Diag.2 in that sente attacked without pushing the pawn on 2nd file, though. The slight difference may have an influence to the position. Now, the position is in the endgame.